Glamourie is a Scots word meaning a charmed condition in which everything is invested with magical properties and possibilities. In this unique book, Alice Starmore leads us into the realm of glamourie and -- like the witches of Gaelic folklore -- casts spells with needles and a single thread. Taking her daughter Jade's supernatural stories as inspiration, she uses the art of hand knitting to bewitch and bedazzle, and illustrates the tales with elaborate costumes and accessories that portray fanciful and extraordinary ideas. In creating these costumes, she has powerfully demonstrated the glamourie that can flow from the twin wands of a master magician. While the first half of this book is an unrestrained flight of fancy, the second half contains full instructions for knitting simpler and more practical garments inspired by each costume, all written with Alice Starmore's trademark accuracy and precision. By developing each of these patterns from its associated costume, she has revealed how her mind works and how her imagination led her from the initial inspiration through to the final design. Alice and Jade Starmore are from the Isle of Lewis in the Outer Hebrides, and its moody Celtic landscape is the backdrop to the stories, costumes and designs they have created. The final stage of Glamourie was to take their creations back out into that landscape to be photographed. They trekked to special locations, far off the beaten track, and Jade's spectacular photographs depict both the sweeping panorama and the minute detail of their beloved native isle. 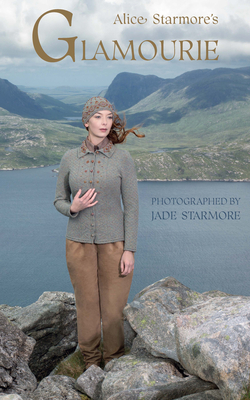 Three years in the making, this combination of photography and fable, of highly conceptual design and practical instruction, will enchant not only knitters but also those in the fashion and costume world and readers fascinated by Scottish and Gaelic legends. An acclaimed textile designer, author, artist, and photographer, Alice Starmore is a native of Scotland's Isle of Lewis. Starmore has taught and lectured extensively throughout Britain, Europe, and the United States. She has written 16 books and countless magazine articles. Dover has previously published her acclaimed Aran Knitting, the classic Book of Fair Isle Knitting, which introduced Americans to the popular traditional technique, and the recent paperback edition of Tudor Roses. Jade Starmore, Alice's daughter, was born and brought up on the Hebridean island of Lewis. She graduated from Glasgow School of Art with a BA first class in Communication Design and an MDes in Fashion & Textiles and is a professional photographer and textile designer. She is also a graphic designer involved in book and website design and is co-founder and creative director of Virtual Yarns, which features her photography, styling, and knitwear designs.